You are here: Home / Tours and Live Performances / 2015 The Original High / Adam Lambert – More Real Than a Ghost! 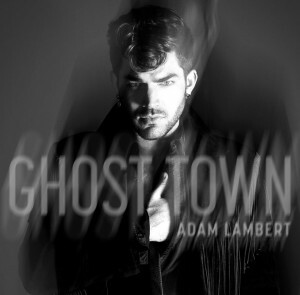 If you’ve been ANYWHERE on social media since last night – as all good Glamberts have been – I know you’ve been able to hear, pre-order, blog and discuss all things Ghost Town! Congratulations Adam Lambert for making one of the most profound new song debuts that I’ve ever seen! Your fans love you, appreciate you and will rock the hell out of all your music! In just the last 60 minutes, look how much Adam has taken over. I’ve compiled a one-stop-shop for you to check it out. He’s everywhere! I hope this is an example of Warner Bros’ commitment to him. It’s so great to see him backed by a label that believes in him as much as his fans do. After the Ghost Town lyric video, visit all the links that are Adam Lambert. Starting with setting your DVRs for his appearance on Ellen, Thursday, April 30th! Let us know what you think of the song too! PressParty says he’s going to be on Ellen April 30. I’m so glad he’s on Ellen. I have sent her messages and I’m glad she is taking the lead to have him on. I assume he’ll sing his new song. I hope he talks to her as well. I admit I’m not thrilled with the new song, not enough singing and too much production for me, but I hope it does well. I never seem to be happy with the songs the label sends to radio….I always like other songs on his album, but that is me. I have to remain positive and support his music as much as possible. I meant to mention Carol, on a different subject, that I love Linkin Park as well. I don’t listen to them all the time and I haven’t attended a concert (I’m so busy and Adam takes up some time), but they have a great singer in Chester and I love the unique sound they have. I love Muse as well. We have great taste right? The lyrics are pretty good…..I’d just like less of the break inbetween. It’s growing on me. It took a few listens but now I really love it. More to the point, my teenagers (16 and 19) also loved it, bought it on itunes and put it on their Iphones. It is very unique – nothing like it out there that I can think of. The lyrics are really well thought out. Do you think there is another video besides this lyric video? I’m actually glad the songs aren’t clogged with lyrics, lyrics, lyrics. And this song is listenable over and over (something I personally can’t say about some of his other songs). I’m liking the direction of this album so far! Well hello there Mr. Handsome Adam Lambert. Love the new song! I love You Adam! I have loved Adam Lambert from the first time I laid eyes on him! And I always will. I knew you did not need to win Adam. You have the voice and the class to be a winner anyway!! I will watch you on Ellen.It is always a pleasure to see you. May God bless you sweet heart! I’m so excited for the new album.. I’ve ordered by e-mail and will be receiving package June 16th or mail June 16th. I almost got to meet Adam but my contact married his buddy and they moved to CA. Oh well I’m glad I have my Adam to listen to and watch on u-tube and videos, and listen to CDs. I own many items that Adam has put out – so at least I have my memories. I still remember voting for Adams for 4 hours non-stop on the final night. He is truly the best and the most talented. Adam is so kind. He also looked great on other idols visits – with Angie Miller – far out performance. I’ll bet Angie felt like a million getting to perform with Adam and Jessie J. Ghost Town is naturally fab. God Bless you Adam. Keep on making music for all us music lovers. Adam is one of a kind. As he admitted, he’s learning and he is just getting started in discovering himself as an artist. I want naked love, no glitz, no masks, just him and his incredible talent. Adam, you’re coming full circle…..love your voice no matter what you sing! Loved & enjoyed you with Queen and if you ever do an album of your favorite songs, I hope there is some Elvis included! Rock on young man……. This is so exciting to see Adam’s new transformation right before our eyes! I have had to play the song a couple times to really appreciate it and the uniqueness of it! I am praying that this new single gets radio play EVERYWHERE…worldwide! This seems to be one of the main hurdles for Adam & helping to further expose his SUPERSTAR TALENTS to the masses! Hoping Warner Brothers fully supports this amazing human being & all his endevours going forward. Bless Ellen for always supporting him. She is amazing herself & I admire her greatly. Many people watch Ellen’s show so I also hope he is able to both sing & be interviewed on this show! Saw Adam here in Vancouver, B.C. with Queen…UNBELIEVABLE…One of the BEST concerts I have ever seem. My girlfriend doesn’t follow Adam & she agreed that it was indeed one her best she has ever seen as well. I CANNOT WAIT for the CD release date! My world has never been the same…ever since Adam walked on the AI stage. Adam….I can NEVER GET ENOUGH…NEVER EVER! I have to say that I am sooo happy for Adam and his Ghost Town. With the help of Max Martin et al, this should be a big hit on the radio. But I am concerned that he’s competing with Madonna. I’ve heard her song now a few times on my local radio station, but not his — not once!! Adam has a new maturity about him and I know there are only good things for his future. I am a die hard ADAM Lambert fan. Been to several of his concerts and about 6 with him and Queen. This song just did not meet my expectations . ADAM has this amazing voice, but this background “stuff” just takes away from his performance. Wish he would do more classic rock, like Queen. I want to hear his vocal range and purity .